There are three main processes involved with anesthesia: Preparation, induction and maintenance. It’s important to separate the human experience of anesthesia from what a cat experiences. While a human comes out of general anesthesia feeling nauseous or with a headache, a recovering cat is rarely nauseous. And because vets routinely administer pain medication (analgesia) as part of general anesthetic protocol, cats usually awake headache free. While anesthesia is not totally without risk, the risk is mitigated by two factors: todays exceptionally safe and flexible anesthetic drugs and vets experienced in how to anesthetize their patients…from small kittens to feline seniors. Since cats are small, strong, wiggly, and squirmy equipped with sharp claws…….even minor procedures can be challenging…….and wrestling with a stressed cat makes the animal even more agitated (not to mention the vet). The purpose of cat anesthesia is to bring about the loss of pain sensation, muscle relaxation, and loss of consciousness. The muscle relaxation and suppression of reflex movement are for the convenience of the veterinarian but unconsciousness also assures the cat won't remember what happened. Anesthetic agents are used for exploratory procedures such as biopsies; for superficial procedures such as closing wounds; for deep surgical procedures and for euthanasia. Drugs can be administered intravenously, intramuscular, or by inhalation. They enter the cat's blood stream and travel to receptors in the brain and a state of cat anesthesia is induced. Drug companies worked hard to develop anesthetic agents that not only effectively induce anesthesia but also are quickly expelled from the animal's body. Speedy expulsion of anesthetic agents is important because it minimizes undesirable side effects. Anesthesia is an integral part of more high tech diagnostic techniques. It is less invasive for even nonsurgical approaches to take a peek at what’s going on inside a cat’s body. Endoscopy and biopsy are examples of less invasive diagnostic procedures where anesthetics may assist in finding answers. Before surgery, the anesthetist selects the anesthetic drugs suitable for the individual patient and the particular surgery the animal will undergo. The goal is to take the cat as safely as possible to an anesthetic depth where the cat is pain free etc. The depth of cat anesthesia depends on the type of procedure. Painful procedures require deep anesthesia while superficial procedures such as teeth cleaning involve the use of lighter anesthesia. Age and physical status of the cat also influence the anesthetist's decision regarding the depth of cat anesthesia. During surgery, the anesthetist constantly monitors the anesthetic state to ensure that the patient remains pain-free and does not experience complications. After surgery, the anesthetist and nursing staff assist the cat in recovering from the cat anesthesia with as little stress and pain as possible. Because general anesthesia is a stable state that provides the patient with maximum support, even a very sick cat usually does well under general cat anesthesia. The animal is receiving oxygen, fluids, and has no pain...an optimal condition for a sick animal. Today, it is not uncommon to successfully anesthetize 18 year old cats that are sick or debilitated. However, anesthesia is not guaranteed to be risk free. Owners should be aware of risk factors and discuss them with their vet. 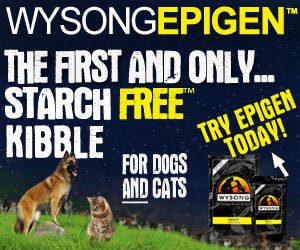 Healthy young cats are an excellent risk. Cats with mild signs of unhealthiness are a good risk. 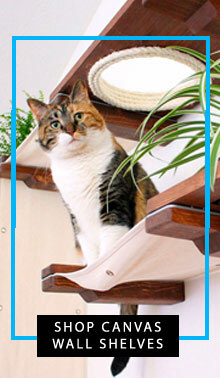 This category includes cats with simple fractures, overweight cats and even some older cats. 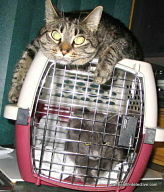 Cats with signs of moderate to major disease; such as heart disease, are a fair risk. Cats suffering from life-threatening diseases that necessitate major surgical procedures are a poor risk. Cats close to death or suffering severe trauma from, for example, being hit by a car are a very poor risk. Because there is no uniform approach to anesthesia, every anesthetic plan...selection of drugs, depth of anesthesia, choice of anesthetic technique...should be custom designed for the individual cat. An important part of this is the owner providing the veterinarian with as complete a medical history as possible. It is particularly important to recall any previous difficulties with anesthesia. If you've had the same vet for years he may already be aware of your cat's history, but such is not always the case. In addition to medical history the vet will give your cat a thorough physical examination. Blood and urine samples provide important information about the status of your cat's internal organs. In some cases, your vet may also recommend chest x-rays and a heart test such as an electrocardiograph, which measures heart activity. Accurate physical status information not only enables the vet to plan an appropriate anesthetic protocol for your cat but also is invaluable should any unexpected complications arise during anesthesia and recovery. In preparation for administering cat anesthesia, the anesthetist must first administer a chemical restraint to sedate the cat. The calm atmosphere enables the anesthetist to complete the preparatory activities. Once the cat is sedated, the anesthetist inserts an intravenous line into the cat. This intravenous line is a conduit through which inject-able anesthetics and other fluids may pass. It is also a means of administering emergency drugs should complications arise. Induction is the sequence of drug administration that takes the patient from a conscious to an unconscious state. During induction, the anesthetist takes the animal into the unconscious state as peacefully and safely as possible. A fundamental goal of anesthesia is to use neither more nor less anesthetic than necessary to get the job done. The depth of anesthesia required to keep a cat pain free, relaxed, and unconscious depends on the type of procedure and the individual patient. More painful procedures like spaying a female would have deep anesthesia while teeth cleaning would require only light anesthesia. This is done either intravenously or by inhalation. 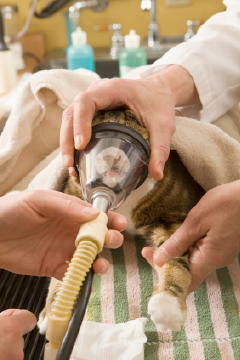 If using inhalation , a mask is placed over the cat's face or the cat is placed in an inhalation chamber. The anesthetist may use short acting barbiturates to induce rapid, painless unconsciousness, followed by other anesthetic agents, or the anesthetist may use the same drugs to both induce and maintain the anesthetic state. Once the cat is unconscious, the anesthetist maintains the anesthetic depth with intravenous and/or inhaled anesthetics...the latter used in combination with oxygen. Although intravenous maintenance is a reasonable technique, inhalants allow moment by moment control of the anesthetic agents, which may be an important consideration for an older or very sick cat. The animal inhales the anesthetic gases either through a mask or via a tube inserted into its airway (intubation). When an inhalation mask is used for induction, anesthetists recommend switching to intubation during the maintenance phase, because intubation establishes an unobstructed airway that could be vital should any complication arise. Older cats, sick cats and some breeds that are subject to some breathing difficulties should always be intubated. However, vets do not necessarily decide to intubate all patients. Do not be surprised if your vet recommends maintaining your healthy cat on intravenous anesthetics occasionally supplemented with an inhalant gas given by mask. 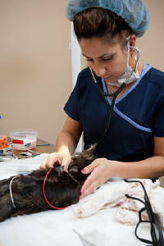 The anesthetist monitors the cat throughout the process to maintain a peaceful and safe state. 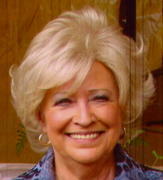 They constantly check the depth of anesthesia to maintain a pain-free, stable state; the rate and quality of the pulse and heartbeat to ensure proper functioning; the lungs to ensure trouble-free respiration; the body temperature to avoid hypothermia; and the mucous membrane to quickly detect an abnormal color, which might indicate complications.